This article appeared in Manushi: A Journal of Women and Society, Issue 150 and was published online by India Together in November 2005. It also appeared in Himal Magazine (September-October 2005) (listed here, archived here) under the title “The Cup and Me.” It appears on the AID website as Greeting Aunt Flo. When I read about Gita’s menses in Kirin Narayan’s novel Love, Stars, and All That, I felt many a page was yet to be written of this rarely told yet widely experienced love-hate relationship. Would I ever attain the peace of Anne Frank, who wrote in her diary that she cherished her monthly cycle as her own sweet secret? Growing up in Indiana in the 1970s, I got from my parents the impression that we would be moving back to India in the near future. In fact, we never even visited the country till I was 13 … why buy round trip tickets when you can wait another year and fly one-way? And so braving the heat one fine November in Tenali, I learned to wear a half-sari, since that is what a “mature” girl wore. I preferred to wear it the way others did, falling in a V behind my knees, rather than square with the hem of my parkini as in my mother’s day. Catching trains at all hours, we visited every branch of the family. I never could find a trash can when I needed one, so when I woke up one day in yet another family member’s home to find I got my period, I asked where I should dispose of my napkins. What a shock to learn their plan was instead to dispose of me! Confined to the corner of a room at one end of the house, I could go out to the bathroom only by the side door. The rest of the house was forbidden territory, as were the shelves and cabinets in the room I was in. Meals would be brought to me. For three days. I cried and cried. A good deterrent to crime, I thought, this taste of jail. My cousin came to play cards with me as long as neither of us touched the same card at once. And at the end I had to wash all my clothes. Not before, mind you, for my touch would have contaminated the water supply. Here I was, supposedly of the Valnadi Vaidikulu, highest of high castes, yet untouchable all the same. If only someone had told me then about Chokha Mela, who wrote in the 14th century that from this untouchability springs life itself, perhaps I would have had some hold against the abyss taunting my adolescent self-esteem. But there was no one to tell me of such affirming things, not until another time, another place. It was in a tribal village in Maharashtra that I first learned about the cup. Not from a villager, mind you. I have no idea what they used. I never asked, they never told me. It was the rest of us non-tribal visitors to the area who had to discuss our sanitary needs. No trashcans were in sight, so those using disposables tidily packed and carried them back to the city. Those of us using cloth could easily wash them, but had to find a sunny yet discreet place to dry them. I chose the rooftop – those tiles really absorb heat! One young woman from Canada, however, told me that she used a cup made of rubber that she could simply empty, wash, and reinsert in less than a minute. How many hours, how many gallons of water, and how much trouble could I have saved had I tried the cup then? Now when I tell others about the cup and they have qualms, I can only smile. Even when I finally decided to get one, years after knowing about them, many moons waxed and waned before I actually did. And what a difference it made! Thinking back, part of the reason I could not quite shrug off that sense of “wrongness” those relatives of mine conveyed about menstruation was that it simply was a graceless ordeal, month after month. There were times in college I remember my insides churning and thighs aching so much I barely made it to class. Sometimes my flow was so heavy that between bathing and leaving the house in the morning I would have to change pads. The smell, the leakage, the bulkiness, and discomfort in that sensitive area left me accepting that maybe I was too dirty to go to the temple. Even my bad uncle felt the need to change his threads when he found out I was menstruating. There was humour as well. I remember visiting some relatives soon after marriage. My aunts were “resting.” Since no one knew I was “resting” too, I could have cooked, but my dear husband took us all out (breaking other, less rigid, rules). Both my aunts sat at one end of the table and had all items served to them before the rest of us shared them. Better than eating last, I suppose. Other euphemisms I heard people use to refer to menses were “baiTa” meaning “outside” or “ibbandi” meaning “inconvenience” or even, contranymously, “maDi” normally used to refer to ritual purity. In the restaurant, all of us and the cooks and servers were outside the circle of purity, so these distinctions were meaningless. It was my commitment to a cleaner environment that had motivated me to try cloth pads, which I first found in the Harvest Co-op in Boston where I bought my groceries. But I immediately discovered that they relieved other problems as well – no odor, less leakage, and so much more comfortable. The first day I used them I had dance class, and they sure proved their mettle through all those jumps and squats in aramandi. There was definitely no going back. A pack of three winged pads with six inserts cost $25 and it took me some time to accumulate enough so that I never had to use disposables again. Back then the only kind in the store was called Glad Rags. Well, I used mine till they turned to rags. Ten years later, after having a child and preparing to ovulate again, I found many brands of cloth pads online. I promptly ordered some but also began thinking seriously about the cup. In retrospect I wonder why I had waited so long. Finally, after consulting some of my online pals, who positively raved about the cup, and deciding whether to get rubber or silicone, and reassuring myself with the manufacturer’s guarantee, I got it. And looked forward to my next period like never before. A few months later, we went to the Grand Canyon. When I got my period, one remarkable difference struck me. Though we were traveling and hiking, I heaved no sigh of relief at end of my flow, just as I had not met its onset with so much as an “Oh dear.” It really did not matter when Aunt Flo came and went. At last my period is an entirely internal matter. It is no longer an inconvenience. Author photo that appeared in Manushi, Issue 150, where this article was first published. 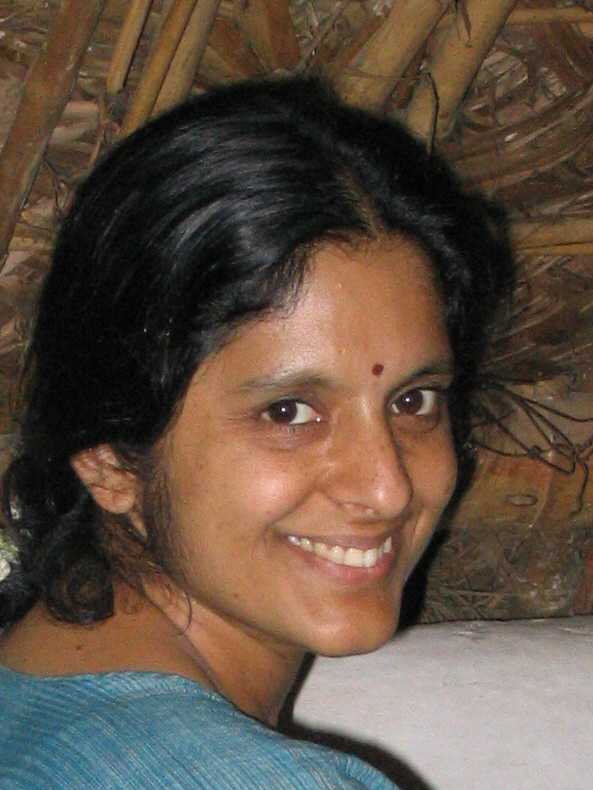 Photo taken in Palaguttapalle chez Aparna Krishnan & Nagesh Kolagani. 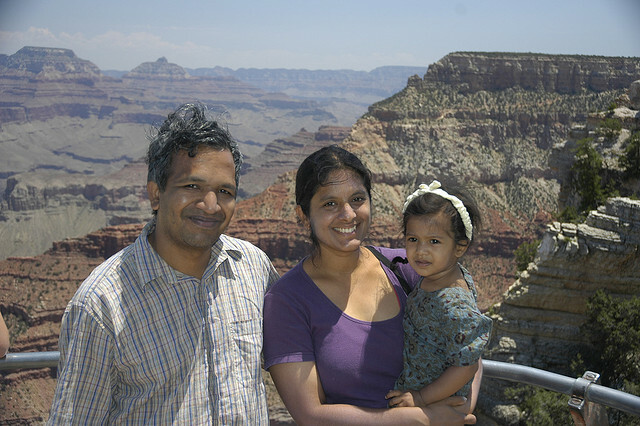 This photo of the author and family at the Grand Canyon appeared along with the article in Himal South Asia magazine, Sept-Oct 2005.